WHAT CORE VACCINES ARE RECOMMENDED FOR DOGS? 1. DA2PPV: This vaccine helps build immunity against distemper virus, adenovirus 2 (hepatitis), parainfluenza virus, parvovirus. This is a modified live vaccine. 2. Rabies: This vaccine protects against rabies virus. This is an inactivated vaccine. After dog has puppy series and annual booster, both vaccinations are due EVERY 3 YEARS. MODIFIED LIVE VACCINES SHOULD NOT BE GIVEN TO PREGNANT ANIMALS. 1. Bordatella bronchiseptica: This vaccine helps protect against kennel cough. This vaccine is recommended to any dog who frequently comingles with other dogs (such as kennels, dog parks, dog shows, etc) This vaccine can be given any time after 12 weeks of age, and is boosted every 6-12 months depending on individual risk. ANNUAL PHYSICAL EXAMINATION BY VETERINARIAN IS RECOMMENDED. 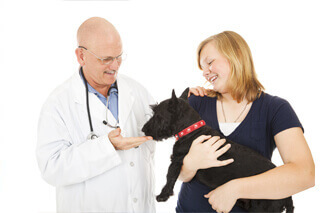 ALL PETS SHOULD BE SEEN BY VET AT LEAST ONCE A YEAR TO ENSURE SYSTEMIC HEALTH, PREVENT DISEASE, AND IDENTIFY PROBLEMS EARLY IN COURSE OF DISEASE. tHIS IS AN OPPORTUNITY TO DISCUSS DENTAL HEALTH, NUTRITION, EXERCISE, BEHAVIOUR, AND SCREENING LABWORK.